A power brake booster, or hydro-boost power brake system, uses hydraulics while a vacuum brake booster uses a vacuum to stop your vehicle. If you own a vehicle made after 1968, it’s likely that you have a power brake system. While there are several evolutions of this vital vehicle operating system, the basic premise of applying leverage, forcing hydraulic pressure, and friction still remains the fundamental process for slowing and stopping a vehicle. One of the most commonly misunderstood issues is understanding the difference between a power brake booster and a vacuum brake booster. In all truth — a power brake booster and vacuum brake booster are the same part. Each utilizes vacuum pressure to assist in the application of hydraulic fluid and utilizing friction between the brake rotor and pads. Where confusion exists is calling a Hydro-Boost Power Brake Assist System a power brake booster. A Hydro-Boost system bypasses the need for vacuum and uses direct hydraulic pressure to accomplish the same task. In order to simplify things, let’s break down how a vacuum-based brake booster works as opposed to a hydraulic-based brake booster, along with a few tests for diagnosing potential problems with both. How Does the Vacuum Brake Booster Work? A vacuum-based brake booster receives its power via a vacuum system attached to the engine’s intake manifold. Vacuum is circulated through the brake booster, which applies pressure to the hydraulic brake lines when the brake pedal is pressed. This system is used in a vacuum booster or power brake booster. The vacuum supplied by the engine operates an internal bladder, which supplies the force to the hydraulic brake lines. No vacuum pressure from the engine. 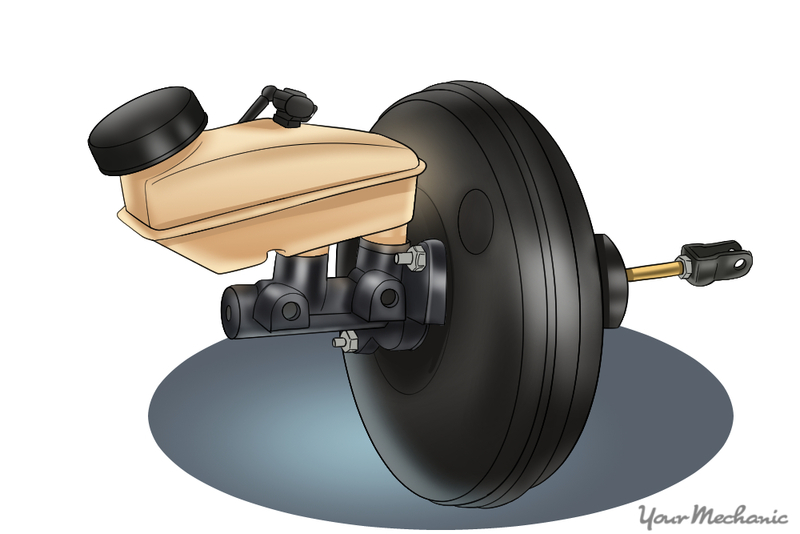 Inability of the brake booster to absorb or create a vacuum internally. Broken internal parts, such as the check valve and vacuum hose, inside the brake booster that fail to supply power to the hydraulic lines. What is a Hydro-Boost Power Assist Service? The hydro-boost power system works nearly identically to the vacuum-based system, but instead of relying on vacuum pressure, it uses direct hydraulic pressure. It is powered by the power steering pump and will typically fail at the same time as power steering. In fact, that’s typically the first indicator of a hydro-boost power brake failure. However, this system utilizes a series of back-ups to keep the power brakes working for a short period of time in the event of a ruptured power steering hose or broken power steering belt. Why is a Power Brake Booster Called a Vacuum Brake Booster? A brake booster is designed to provide power-added assistance to help apply the brakes. It’s mainly due to the job of a brake booster that a vacuum-assisted system is called a power brake booster. It’s also common for a hydraulic-powered brake booster to also be associated with the term power brake booster. The key to knowing which type of brake booster is used on your vehicle is to consult your vehicle owner’s manual. Most of the time, this question is asked when a problem with your brake system has popped up. A professional mechanic can be quite helpful in diagnosing a problem with your brake system. During a brake system inspection, they’ll complete several diagnostic checks to determine the root source. This includes the power brake booster. If you have a vacuum-based system, or hydraulic, they’ll be able to identify the issue and recommend the best replacement parts and repairs needed to get your car back on the road.